IN A NUTSHELL: Nutritional ketosis is a healthy metabolic state in which your body is efficiently burning fat as its primary fuel source instead of glucose. You can think of it as converting yourself from a “sugar burner” to a “fat burner”. Simply reduce your carbohydrates, increase your intake of healthy fats, and consume only an adequate amount of protein to meet your body’s needs. The term nutritional ketosis was originally coined by Dr. Stephen Phinney & Jeff Volek, two of the leading experts and researchers in the field of low carbohydrate dieting (Watch this informative video to hear a talk from Dr. Phinney on the “Art & Science of Nutritional Ketosis). By following a ketogenic diet that is high in fat, very low in carbohydrates, and adequate in protein (Please Note: “adequate” in protein, NOT “high” in protein. More on this later). By consuming more lipids you are enhancing your body’s fat burning function by up-regulating the enzymes and other “metabolic machinery” needed to burn fat more efficiently, therefore making it easier for your body to tap into stored adipose tissue as an energy source (i.e. you turn yourself into a fat-burning machine!). But don’t we NEED carbohydrates? While it’s true that our red blood cells and a small percentage of brain and kidney cells are exclusively glucose dependent, the body can actually GENERATE carbohydrates in a process called gluconeogenesis in which certain non-carbohydrate substrates like proteins (amino acids) and certain constituents of fatty acids (glycerol) can be converted into glucose. The quantities of glucose produced by the body are sufficient to meet the needs of these particular cells and also help to balance the body’s blood sugar levels. Ketogenic diets are not necessarily ZERO-carbohydrate diets and were typically able to get enough carbohydrates from vegetables, fruit, and some beans and legumes (unless the ketogenic diet is being used therapeutically for a condition such as epilsepy, in which case carbs must be strictly limited to induce a deeper state of ketosis). There is also a common misconception that the brain can run only on glucose, BUT, there is in fact a fuel source that the brain actually prefers over glucose: KETONES. And what exactly are ketones? Ketone bodies are byproducts of fatty acid catabolism (break down of fat) and can replace glucose as a primary fuel source for cells of the brain. The brain cannot directly utilize long-chain fatty acids for fuel since these types of fats cannot cross the blood-brain barrier. However, ketones can easily pass through this barrier and your brain becomes more efficient at utilizing ketones over time. Beyond just providing the brain with fuel, ketones appear to have many therapeutic effects on the functioning of neurons and are being intensely researched in their applications for epilepsy, Parkinson’s, Alzheimer’s, depression, anxiety and other cognitive disorders. But doesn’t eating fat make you fat? And clog your Arteries? And cause high cholesterol? Most of the scientific literature that correlates dietary fat with weight gain and health problems is based on studies in which fat was consumed in the context of moderate-carbohydrate or high-carbohydrate diet. But what happens if you drop the carbs and keep the fat? Okay, time for a quick science lesson: When you consume carbohydrates the body releases the hormone insulin which allows for glucose to enter cells to be burned for energy (that is, if you are doing adequate physical activity, otherwise if you are sedentary these carbs are stored as FAT). What’s important to understand is that insulin blocks fatty acid catabolism, i.e. eating carbohydrates essentially blocks fat-burning. And eating fat does NOT cause an insulin release. See where we are going with this? So eating HIGH amounts of fat while staying LOW-CARB allows the body to become more efficient at BURNING fat instead of STORING fat. The old paradigm of “eating fat makes you fat” is finally shifting and the once vilified dietary fats and cholesterol are finally being vindicated. 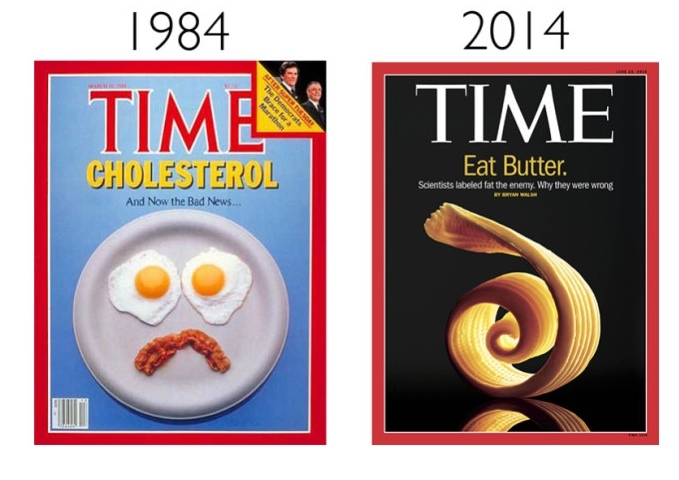 For a fascinating history on how the low-fat craze started, check out this article written by Ann LaBerge: How the Ideology of Low Fat Conquered America. So where did the ketogenic diet originate? Well, quite simply, from Mother Nature! This isn’t just another “low-carb” fad diet that was concocted to help promote weight loss — this is essentially how the majority of us were evolutionarily designed to eat! Many indigenous cultures from the Inuits of North America to the Masai of Africa have traditionally eaten diets consisting of macronutrient ratios similar to ketogenic diets. What’s more is that these societies have subsisted on this type of diet for thousands of years without the major health complications that plague many modern civilizations today. Famous doctors, researchers, and explorers such as Vilhjalmur Stefansson, Weston A. 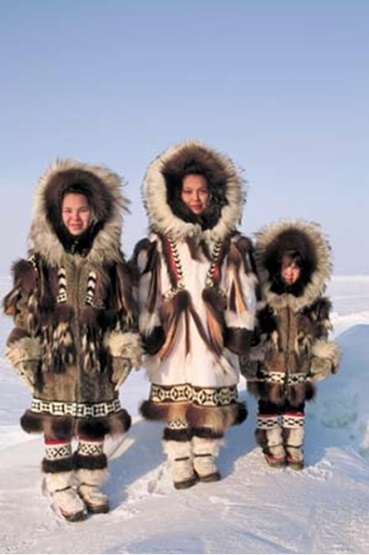 Price, George Catlin, John Rae, and Frederick Schwatka, have traveled the world to study and live among many hunter gatherer societies and have all observed a common theme among these cultures: their relatively limited carbohydrate consumption along with their absolute reverence for FAT. So What Does a Ketogenic Diet Consist of? 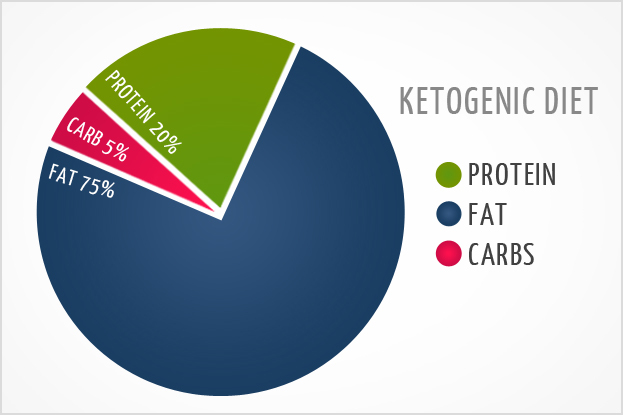 This graph depicts typical macronutrient ratios for a ketogenic diet. While this appears to be very restrictive it’s important to bear in mind that these ratios will vary greatly depending on MANY factors: your current state of health, your level of metabolic damage, hormonal imbalances, physical activity, weight, body composition, genetic makeup, age, gender, etc. For example, someone who is young, lean, fit, works out on a regular basis, and who doesn’t have a predisposition towards insulin resistance may have a higher threshold of carbohydrate intake and be able to enter ketosis more easily than someone who is older, overweight, and diabetic who has sustained a great deal of metabolic damage due to years of excessive carbohydrate consumption. The latter individual may initially have to be more restrictive about their carb intake in order to induce nutritional ketosis (essentially, those with insulin resistance can sort of be viewed as having a “carbohydrate intolerant disorder”), but they may eventually be able to increase their intake of carbs after they have been able to regulate their blood sugar and repair their metabolic damage over time. So How Many Carbs Can I have? And What About Protein? Generally, most people can initiate ketosis by reducing their carbohydrates to daily total of 30-50 grams per day (approximately 5-10% of daily calories) while also consuming an adequate amount of protein (which is calculated based upon your gender, body weight, and lean muscle mass). It’s essential to keep protein at a moderate level as excess protein on a low-carb diet can get converted into glucose in a process called gluconeogenesis. Your protein needs should not be calculated as a percentage of your total calories, but instead should be based on your body weight, total lean mass, and level of physical activity (Check out this awesome keto calculator if you want some help figuring out your own macronutrient ratios). Carbs and protein together will make up about 20-30% of your diet. As for the rest of your calories? All from FAT! 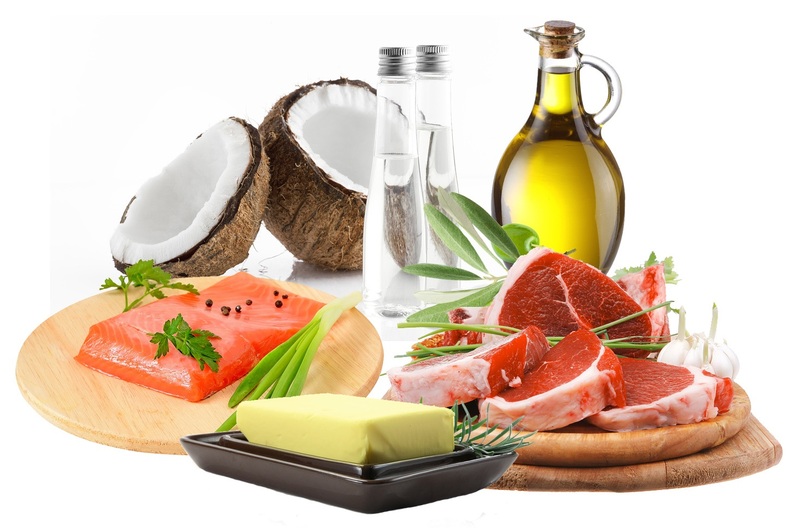 On a ketogenic diet you will derive approximately 70-80% of your daily calories from healthy fats (i.e., pastured animal fats, pastured eggs, grass-fed butter, coconut oil, ghee, olive oil, avocados, macadamia nuts, etc. 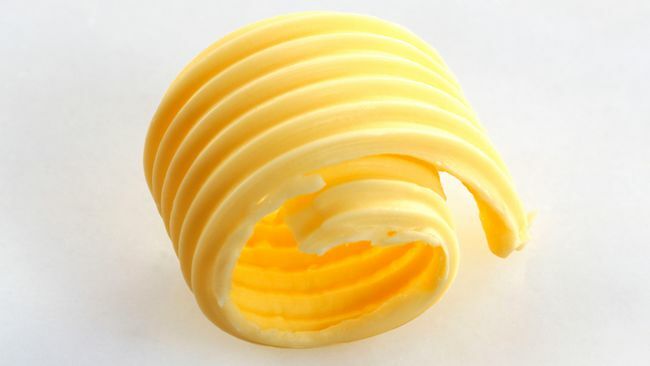 *PLEASE AVOID* margarine, canola oil, soybean oil, and other similar inflammatory polyunsaturated fatty acids (aka PUFA’s). Please also note: It’s very important to work with a knowledgeable healthcare practitioner who is versed in low-carb dieting who can help you create a well-formulated, nutrient dense ketogenic diet that takes into consideration your own unique needs and bio-individuality. One of the keys to a successful experience with nutritional ketosis is to maximize your nutrient density (by eating enough plant-based foods such as veggies, nuts & seeds, etc. ), supporting all phases of detoxification, and ALSO by optimizing your metabolism to efficiently burn fat and produce ketones. This is NOT about stuffing yourself full of butter and bacon all day! You must also be sure to obtain enough vitamins, minerals, and antioxidants, and minerals from plant foods. It’s vital to keep in mind that it takes some time to convert your body over from a state of primarily “sugar-burning” to “fat-burning”. The length of time will vary from person to person based on the same individual factors listed above that dictate your total carb intake, but the typical adaptation period can range anywhere from 3-6 weeks. During this time you could experience some symptoms related to “carbohydrate withdrawal” such as headaches, fatigue, light-headedness, etc. Typically, these are all TEMPORARY experiences while your blood sugar rebalances and your body adjusts to its new fuel source (fat & ketones). Additionally, until your brain “learns” how to utilize ketones as it’s primary fuel source you may also experience temporary “brain fog” and problems with focus, concentration, and memory. Some symptoms could also be caused by mineral deficiencies, dehydration, or electrolyte imbalances that may occur in the initial stages of a ketogenic diet when your body is depleting its glycogen stores and ridding itself of excess water. Increasing your water intake along with consuming extra salt and electrolytes often helps to alleviate these symptoms. Also be mindful of your caloric intake and try not to be restrictive during the adaptation period to give your body the energy it needs. Generally, most people feel that they are in a state of steady nutritional ketosis once they see a reduction in the adaptation symptoms and a reduction in hunger and cravings, while also experiencing an increase in energy and mental clarity. But the most accurate way to know for sure is to test your ketone levels with a blood ketone monitor, similar to testing your blood sugar with a glucose monitor. (Important note: there are two types of ketone bodies that can be measured – betahydroxybutyrate (BHB) and acetoacetate. BHB is measured in the blood and is generally regarded as the more “accurate” biomarker for determining ketosis. Acetoacetate is excreted in the breathe and in the urine and can be measured by breath devices and urine tests strips, both of which I have utilized personally and find to be a little less accurate than blood ketone readings). Most people start to enter ketosis when blood ketones reach a level of 0.5 mM/dL of blood. However, the optimal range for blood ketones is from 1.5 – 3.0. 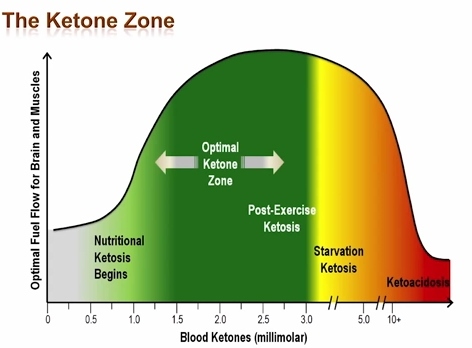 This is considered the “sweet spot” of ketosis that helps support the most health benefits if maintained long term. Graph borrowed from the phenomenal book by Dr. Stephen Phinney and Dr. Jeffrey Volek, The Art and Science of Low Carbohydrate Living. It’s imperative to realize that there is a “danger zone” to ketosis known as ketoacidosis that people commonly confuse with nutritional ketosis. However, ketoacidosis usually only happens in those with Type 1 diabetes or late stage Type II diabetes in which the pancreas is unable to secrete sufficient quantities of insulin (insulin has a suppressant effect on ketone production) OR in those with severely compromised kidney function that cannot properly excrete excess ketones. Otherwise, nutritional ketosis is a completely natural, normal, and healthy state for most individuals. What are the Health Benefits to Nutritional Ketosis? Beyond the simple goals of fat burning and body re-composition, there are numerous other reasons why nutritional ketosis may be optimal for health and may even help ameliorate existing health problems. Blood Sugar Balancing. Ketogenic diets are being utilized more and more for improving health conditions related to insulin dysregulation and blood sugar abnormalities, such as Type 2 diabetes, PCOS, and Alzheimer’s disease (which is often referred to as “diabetes of the brain”). Improved Mood & Mental functioning. Many keto adapted people report major improvements in brain function in regards to clarity in thought, memory, and mental functioning that they never experienced previously in their life! Vast improvements in mood disorders such as depression and anxiety are also commonly reported. Lean tissue preservation (Increases muscular retention & prevents muscular atrophy). A ketogenic diet is a highly muscle-sparing diet and it is being explored not only by body builders, athletes, and other fitness aficionados, but also for muscle-wasting conditions like ALS and sarcopenia in the elderly. Greater Athletic Performance. Many athletes also claim to have better results while performing in a well-adapted ketogenic state, particularly endurance athletes. Once keto-adapted, there’s no more need to constantly fuel the body with sugars snacks and sports drinks if you can tap into your body’s fat store for energy. Long-lasting ENERGY. When your body is in a “fat-adapted” state it can easily tap into your adipose tissue to give you more sustained energy without the constant need to eat and “refuel” yourself every couple of hours. Hormone Balancing (Especially in women with PCOS). Chronically elevated levels of insulin and glucose are thought to have a disruptive effect on hormone and endocrine organ functioning throughout the body. Therefore a low-carb diet such a ketogenic diet may be beneficial for improving and optimizing hormone levels by lowering insulin and glucose levels. Nutritional ketosis is especially being researched in helping women with PCOS, a hormonal imbalance which is ultimately caused by insulin resistance similar to diabetes. Need for LESS sleep! While some keto-dieters report deeper sleep in LESS time (sometimes only 5-6 hours a night for some people!) and yet wake up feeling very well-rested. Can you imagine getting LESS sleep (yet still being energetic and vibrant) and therefore having MORE time to be productive in your waking hours? Improvements in Dyslipidemia (Cholesterol Imbalances & High Triglycerides). Many studies have shown that a low-carbohydrate diet is able to significantly improve cholesterol profile as well as reducing triglyceride levels. Reduced Hunger. A meal that is high in fat and protein leaves us feeling satiated much longer than a high carbohydrate meal and helps regulate blood sugar levels, thusly balancing our appetite, especially in those with diabetes or other metabolic abnormalities. Being ketogencially adapted also allows your body to access its fat stores more readily when your body requires more energy to meet its demands, thusly also leading to a reduction in appetite. Nora Gedgaudas, one of my favorite experts in the realm of ketogenic dieting, goes so far as to call the ketogenic diet the “Holy Grail of Diets” because of its superior health benefits as compared to a high carbohydrate diet. Watch this fascinating video to hear her speak about ketosis at the Ancestral Health Symposium in 2012. This informative read by nutritional ketosis blogger Jimmy Moore provides a personal account of the many other health benefits a ketogenic diet can offer. 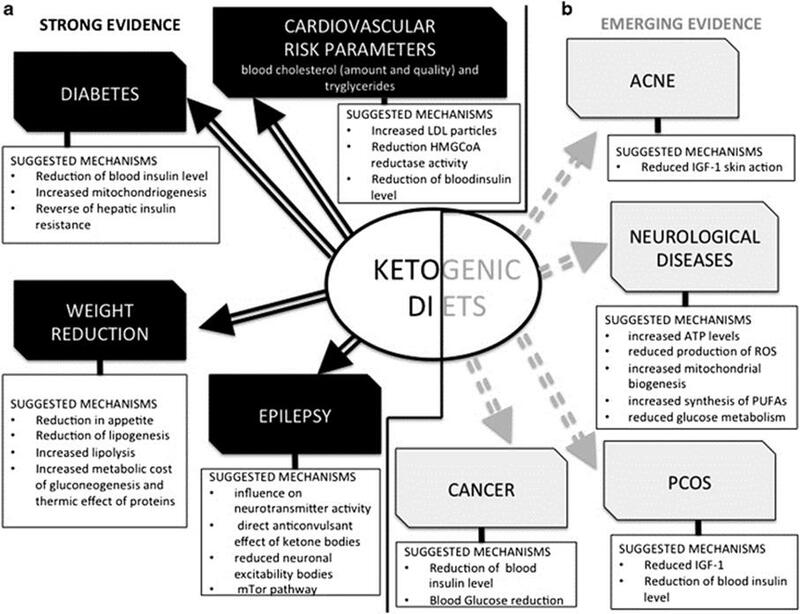 Possible physiological and biochemical mechanisms for the therapeutic action of a ketogenic diet in diseases and conditions for which there is strong scientific evidence (a) and emerging evidence (b). Source: “Beyond weight loss: a review of the therapeutic uses of very-low-carbohydrate (ketogenic) diets.” by Paoli, Volek, et. al. Nutritional ketosis is also being researched for its ability to help with conditions such as diabetes, epilepsy, cancer, Alzheimer’s, dementia, mood disorders, eating disorders, Parkinson’s, ALS, PCOS, and various metabolic disorders. When well-formulated and correctly adhered to, the ketogenic diet can be incredibly effective in alleviating and possibly even reversing a multitude of health conditions. Please submit any questions you have below! I am a Chiropractor and Naturopath practicing just south of Atlanta. I would very much like your opinion of my book on Nutritional Ketosis . . .
Hi Mike! Sure I would love to check it out! Thank you for this excellent and concise summary of the concept of “Nutritional Ketosis” which I wish I had been aware of before.